Siri Akal Kaur (Maggie Creed, MSc, PhD) is a yogi, healer, recording artist and scientist. She has been enjoying sharing the teachings of Kundalini Yoga with others since 2013, mostly in Ireland & UK, and on her global travels. 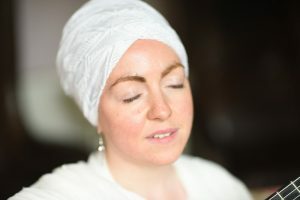 Siri Akal Kaur is a Level 2 certified Kundalini Yoga teacher (500 hr), and a Sat Nam Rasayan healing practitioner. As well as teaching yoga, Siri Akal Kaur ihas a PhD in Environmental Fluid Mechanics from the University of Edinburgh, Scotland. Recently, Siri Akal has been focusing on sharing sacred mantra, blended with her traditional celtic voice, to help people to find the power to transform their lives from within. She will release her first mantra album in September 2018. She is passionate about combining sacred mantra with traditional Irish music, because both traditions have touched her soul deeply. Whether you are a complete beginner or an advanced practitioner of yoga, you will be able to enjoy Siri Akal’s physically challenging yet deeply healing and uplifting yoga classes, usually accompanied by live music with guitar and angelic vocals.